Take a minute to have a look at our events, publications, news and brochures available online. Please contact us at info@beicip.com for further information. Beicip-Franlab is pleased to announce the release of Easytrace 2018 ! Click here to discover the release official announcement. Beicip-Franlab is pleased to announce the release of OpenFlow Suite 2018 ! Our Ocean plug-ins for OpenFlow Suite 2017 are now available for Petrel 2017! OpenFlow Suite 2017 was already containing links with Petrel 2015 and 2016 versions. These new links extend the offer towards last Petrel version. Beicip-Franlab is pleased to announce the release of OpenFlow Suite 2017 ! Beicip-Franlab is pleased to announce the release of Easytrace 2017! Our Ocean plug-ins for OpenFlow Suite 2016 are now available for Petrel 2016! OpenFlow Suite 2016 was already containing links with Petrel 2014 and 2015 versions. The next OpenFlow Suite 2017, to be released in Q2 2017, will be linked to Petrel 2015 and 2016, and extended to Petrel 2017 as soon as this version will be released by SIS. Beicip-Franlab is pleased to announce that Thursday 17th November 2016, Victor Alcobia, Project Director, at Beicip-Franlab, will present a Talk at the European Chapter AGM, in London, organised by the Society Of Petroleum Evaluation Engineers (SPEE). The presentation will be about “Chemical EOR projects and their influence on PRMS application “. We hope to see you there. If you are interested please contact Mr Richard Smith by email at Richard.Smith@gaffney-cline.com The event will be held at the Lloyd’s Register, 71 Fenchurch Street, London. There is a participation fee of £40. PARIS, France – 20th September 2016 – IFP Energies nouvelles (IFPEN), its affiliate Beicip-Franlab (BF) and KAPPA Engineering (KAPPA) have announced the formation of a new partnership to offer the industry a new comprehensive reservoir engineering software workflow. IFPEN is a major public sector researcher dedicated to facing new challenges in the oil and gas industry. 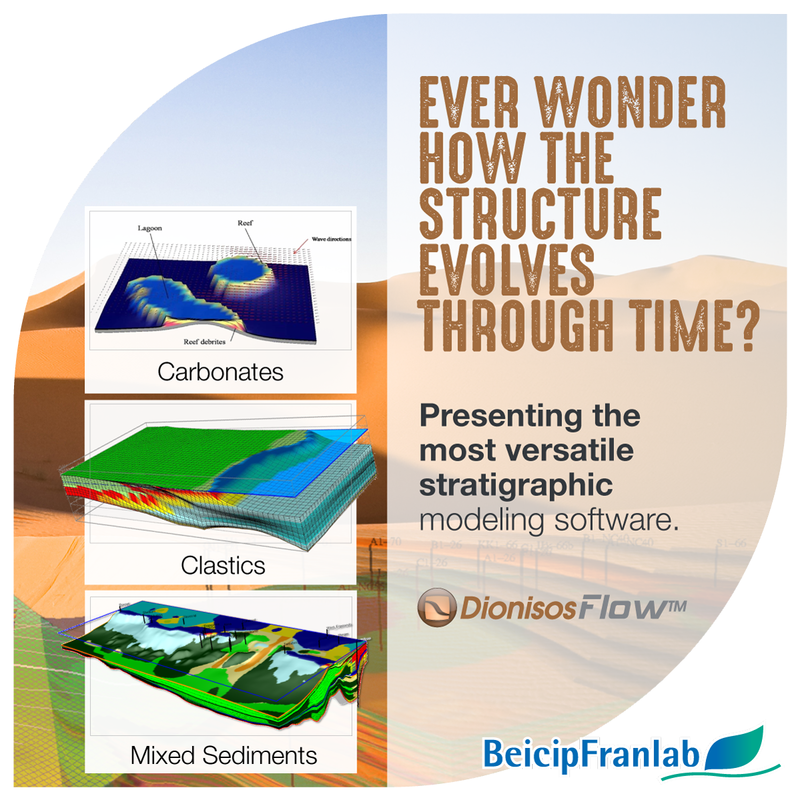 Beicip-Franlab, an affiliate of IFPEN, is a widely recognized consulting firm and provider of geoscience and reservoir software solutions. KAPPA is an independent developer of reservoir engineering software and a market leader in the analysis of dynamic reservoir data. This partnership starts with the addition to the KAPPA software portfolio of two IFP Group reservoir engineering products: PumaFlow™ and PVTFlow™. PumaFlow™ is a full-field multipurpose reservoir simulator. 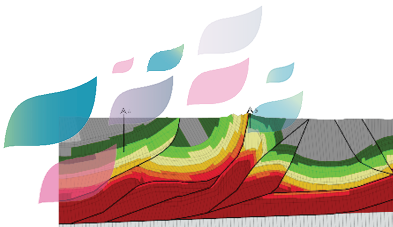 PumaFlow™ offers a user-friendly interface and a numerical kernel known for its rigorous handling of a wide variety of reservoir problems, including fractured formations and EOR. PVTFlow integrates a comprehensive thermodynamic library that can process lab data and feed KAPPA models with black-oil and EOS PVT. Catherine Rivière, IFPEN E&P Unit Director said, “This partnership maximizes the resources of three recognized leaders in the industry to deliver even more expertise and coordinated technical support to clients. It also allows us to integrate innovative solutions provided by each partner in new combined workflows” . Connections are being implemented between PumaFlow™, PVTFlow™ and the KAPPA software suite. Further integration will follow. This agreement will increase client technical support in the field, extending the dynamic data workflow to true full field applications. Beicip-Franlab is pleased to announce the release of Easytrace 2016 ! Beicip-Franlab is pleased to announce the release of OpenFlow Suite 2016 ! Study shows the in place oil and gas resource potential is 25.5 billion barrels of oil and 20.6 trillion cubic feet of gas. August 24, 2016, St. John’s, NL - The Government of Newfoundland and Labrador, Nalcor Energy and Beicip-Franlab announced today that the in place oil and gas resource potential is 25.5 billion barrels of oil and 20.6 trillion cubic feet of gas in the West Orphan Basin located within the area of the Canada-Newfoundland and Labrador Offshore Petroleum Board (C-NLOPB) 2016 Eastern Newfoundland Call for Bids. Nalcor, with its partners TGS and PGS, have been acquiring extensive 2D seismic data (110,000 line km to date) in the underexplored slope and deep water areas of the province’s offshore. To further delineate the West Orphan Basin, a 3D seismic survey was acquired over a portion of the area in the summer of 2015 and the data from the new 3D images has provided further insight into the area’s resource potential. This is the first time a 3D survey has been conducted offshore Newfoundland and Labrador in advance of a scheduled license round. 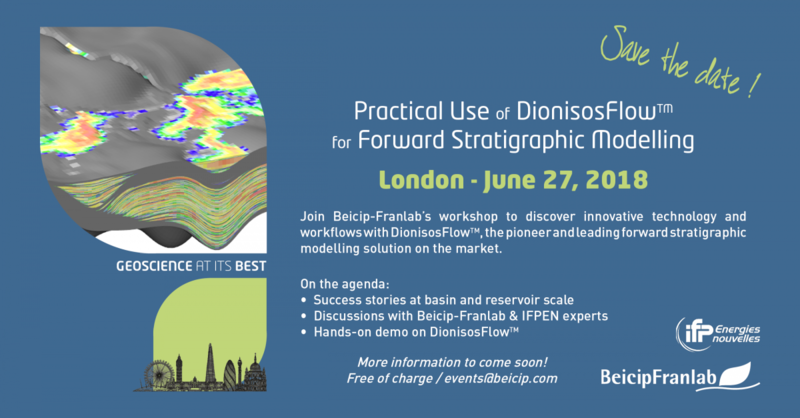 Through the integration of satellite slick data, 2D long offset seismic, 3D long offset seismic and seabed coring a new Lower Tertiary play trend has been identified in the West Orphan Basin. The discovery of this play trend is fully described in a recent Nalcor conference paper accepted for presentation at the Society of Exploration Geophysicists(SEG) International Annual Meeting in Dallas, Texas this fall. This newly identified prospectivity has resulted in Beicip Franlab’s resource assessment identifying the in place resource potential of 25.5 billion barrels of oil and 20.6 trillion cubic feet of gas in this area. The independent assessment is based on new data covering the nine parcels on offer in the West Orphan Basin, an area located 300 kilometres from the northeast coast of Newfoundland. The assessment covers approximately 2% (20,000 square kilometres) of Newfoundland and Labrador’s offshore area. This is province’s second scheduled license round. Future license rounds scheduled through 2020 will follow the same process with detailed resource assessments being conducted and released prior to bid closing. To download a copy of the resource assessment or the SEG conference paper, visit nalcorenergy.com/exploration. Nalcor Energy Oil and Gas is currently a working interest partner in three offshore developments: the Hebron oil field, the White Rose Growth Project and the Hibernia Southern Extension. Nalcor is also leading the exploration of the province’s frontier and deepwater basins by making investments in new geoscience data and analysis to evaluate Newfoundland and Labrador’s undiscovered oil and gas resource potential. Beicip-Franlab is honored to have provided the technical background to the recent Orphan basin offshore Newfoundland & Labrador resource assessment. 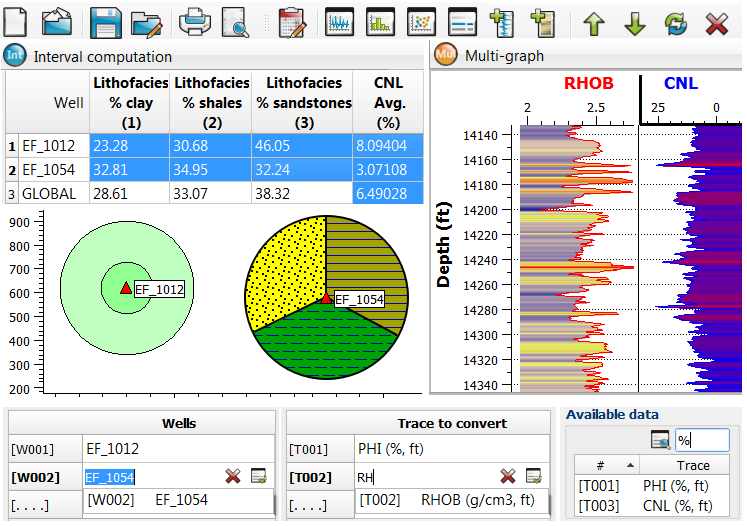 “The independent integrated geological and geophysical study carried out by Beicip-Franlab, supported by the application of leading edge modeling techniques, has been instrumental in identifying and quantifying significant prospective oil and gas resources in the Orphan basin” said Jean Burrus, CEO, Beicip-Franlab. Consult the press conference on video, click here. BF publication | Exploration play fairways in the western Greece . . .
Véronique Carayon, Lucien Montadert, Jonathan Allard (1) , Øystein Lie (2), Sofia Stamataki (3) and Spyridon Bellas (4). 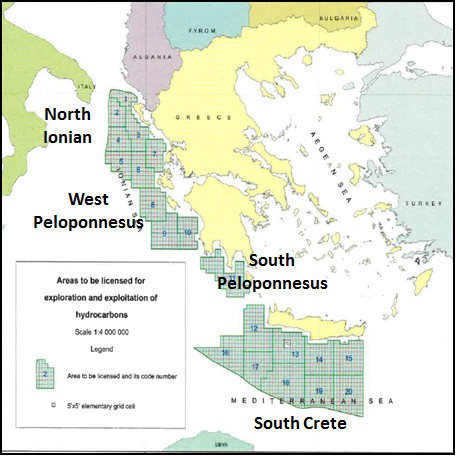 This exploration study realized as a support to the Offshore Greece Licencing Round held in 2015 on behalf of Petroleum Geo-Services was the basis for the delineation of the exploration blocks over the western Greece (Ionian Sea) to the south of Crete (Libyan Sea) offshore. 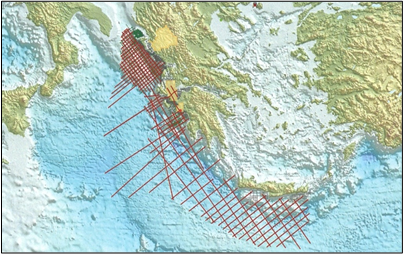 Based on the interpretation of a 12 500 km multi-client 2D “high frequency” seismic dataset acquired by Petroleum Geo-Services over an area of 225 000 km2, this study has enabled to evaluate the petroleum systems and identify exploration play fairways in the western Greece and southern Crete offshore. Conducted over one of the last unexplored Mediterranean basin, this study encompasses: part of the Alpine thrust and fold belt represented by the Hellenides, the shallow water domain of the Apulian Platform and its southern extension within the Ionian Sea, the accretionary prism of Mediterranean Ridge associated to the subduction of the Africa Plate below the Hellenic Arc and remnants of Mesozoic basins with oceanic crust (Deep Ionian Basin and Herodotus Basin). -A regional synthesis of the onshore and offshore Italian and Albanian, Adriatic and Western Greece hydrocarbons E&P results and previous offshore campaigns such as DSDP, ODP and Escarmed. -A structural interpretation of a complex tectonic setting involving subduction/collision and large scale wrench faulting. 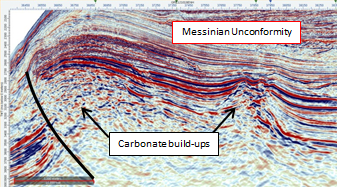 -Existing wells being too sparse to constrain lateral depositional variation, seismic reflectors configuration was used to define relevant tectonostratigraphic units and the respective contribution of their lithological content to potential reservoir rocks, source rocks and seals. -Inventory of the play fairways and leads from the Permian till Pliocene associated to the evaluation of the petroleum systems has led to the evaluation of the potential hydrocarbon resources and exploration risks within the western Greece Ionian Sea and southern Crete Libyan Offshore. The new insights brought by that study are three folds: hydrocarbon resources evaluation within the unexplored deep Mediterranean offshore, better understanding of the evolution of the sedimentary system of a deep basin and its relation with long standing shallow water platform, deepened knowledge about the Eastern Mediterranean Sea geodynamic. BF publication | Dual Porosity, Dual Permeability . . .
1. SE, Abu Dhabi Company for Onshore Petroleum Operations, Abu Dhabi, United Arab Emirates. Initially, the workflow involved an evaluation of Electrofacies (EF) for rock-typing definition, full integration of seismic and fracture characterization, sedimentology, sequence stratigraphy and diagenesis. Based on 43 wells, 11 EF have been defined (6 limestones, 3 calcitic dolomites, 1 shale, 1 dolomitized limestone) for the reservoir using DT, NPHI, RHOB and VCL logs. Poro-perm relations and capillary pressures have been defined for each EF. 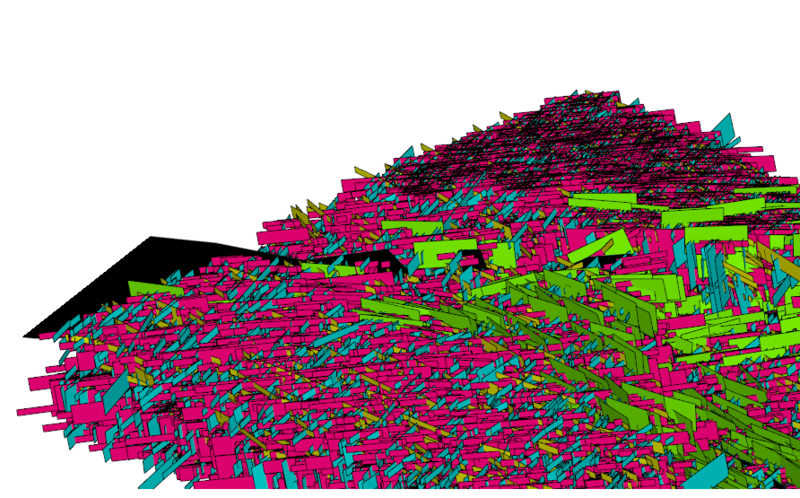 The seismic mapping conversion to depth insured proper horizontal wells placement in the model. Based on Impedance distributions of facies, most porous limestone (EF05), was discriminated from the rest. Therefore, a cube of predicted EF05 with attached probabilities was used in the geomodel. Sedimentological and stratigraphical analysis assisted in defining 4th order sequences between main seismic horizons comprising of depositional, erosions and onlapping, helped to control facies distribution and created an exquisite framework. Secondly, modeling of matrix properties with a nested approach where EF were simulated with pluri-gaussian methods provided a robust integration of seismic and diagenesis distribution. Petrophysical properties were simulated conditionally to the facies for Poro, Perm and Sw, based on the rock-types associations. 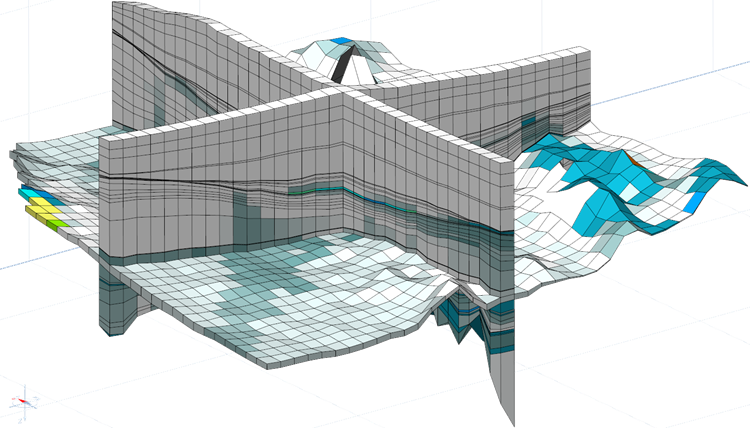 Thirdly, the dynamically calibrated fracture model built previously, using seismic facies maps, fractures density map, rock facies and dynamic reservoir data measurements, has been used to define range of length, spacing and spatial distribution of the fracture system. Uncertainty analysis and upscaling was finally performed, where sensitivity analysis show a maximum 5% of variability from P50. Upscaling reduced 13M active cells to a dynamic case with 1.9M. The upscaled model will be dynamically modeled and historically matched in order to optimize location of new wells and trajectories for increased field production and delayed water breakthrough. “Through our independent geological and modelling analysis of new data from offshore Newfoundland and Labrador, we have estimated significant oil and gas potential within the studied area of the Flemish Pass” said Jean Burrus, CEO, Beicip-Franlab. Interview with Laurent Cuilhé, Director of Operations, Beicip-Franlab. In the frame of the 2014 BF Training Plan, a 5 days field-work session dedicated to clastic depositional systems (Formation BF-002) was led by Stratigraphy, Sedimentology & Petrography Team, in the Provencal Alps (Digne/Annot area). This in-house training was designed for basin geologists, geophysicists and reservoir engineers attentive to increase their knowledge about the intrinsic characteristics (e.g. geometry, nature, heterogeneities) of some siliciclastic reservoir-types to which they are confronted daily. (1) BF trainees on the “historical” Braux Road section throughout the Grès d’Annot, where A.H. Bouma (1962) developed his classical turbidite model. 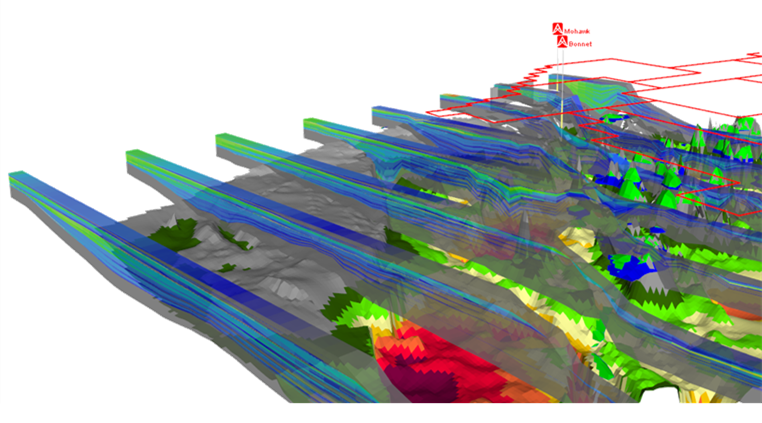 (2) “Seismic scale” panoramic view of deep-sea turbiditic sandy lobes within Grès d’Annot Formation (Chalufy area). Geological field work on rifted basin analogues (Upper Rhine Graben; France/Germany/Switzerland) was organized for PETRONAS-CALIGARI (along BF-BTS/PETRONAS contract frame 2131265WO1). This field-work session, involving a joint team of 9 PETRONAS and 4 BF/BTS representatives, was tied in PETRONAS exploration efforts/activities in East Africa within comparative intracontinental rift basins (e.g. Sudan, Kenya, Tanzania). Beicip-Franlab led a workshop on core fracture analysis at the SPE conference ‘Unlocking Alberta’s Carbonate Reservoirs’. 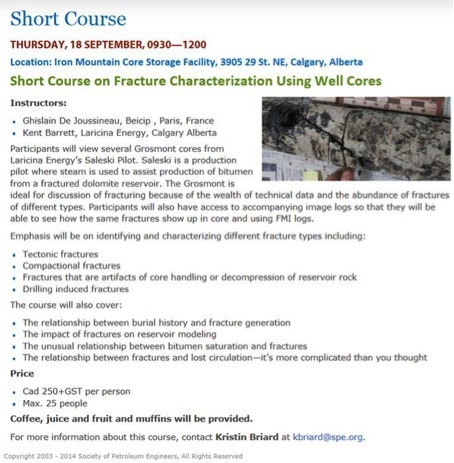 This workshop attended by 15 Industry people (from Husky Energy, Suncor, Osum oil sands, Cenovus…) was the ideal occasion of presenting our fracture capabilities, illustrated by the results of the Grosmont fracture study carried out for Laricina Energy. 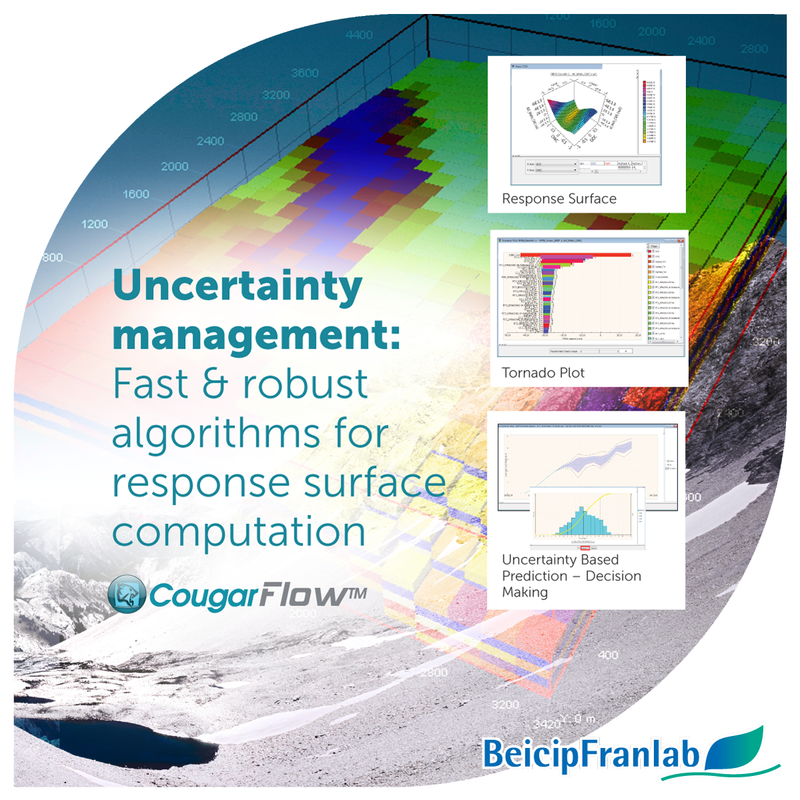 PumaFlow is the all-in-one Beicip-Franlab’s reservoir simulator, ranging from pilot simulation to Full Field prediction of Enhanced Oil Recovery. 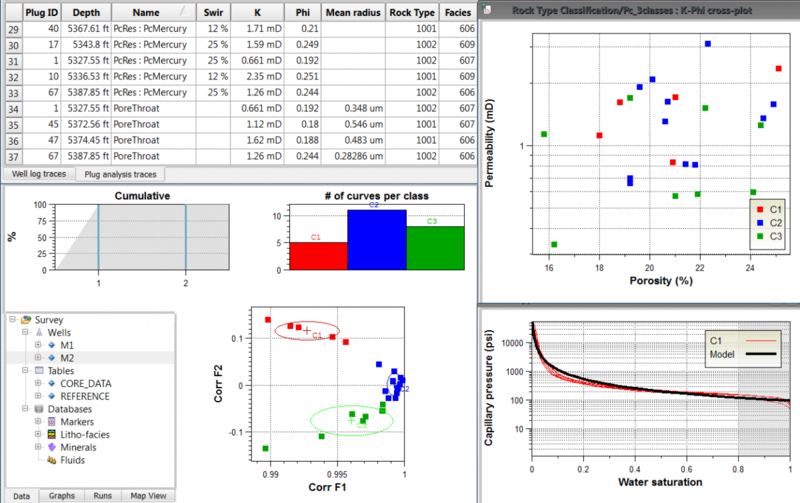 This simulator is designed to improve up-front decision-making, allowing reservoir engineers to forecast a range of production scenarios based on different variables. > Gas-oil relative permeability curves may be modified according to phase recognition. > Specific to the shale gas option. Beicip-Franlab is pleased to announce the new release of EasyTrace. It contains improvements of existing functionalities and some new features too. A new module for pore pressure prediction is available in the Applications menu. The 2014 version also offers several enhancements and bug corrections in reply to clients’ feedback, as well as offering improved general operation of EasyTrace. 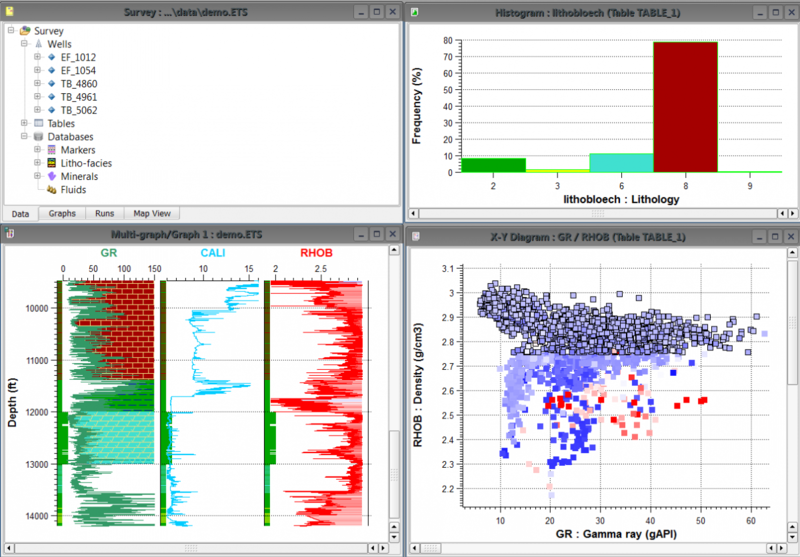 Beicip-Franlab is pleased to announce the release of OpenFlow Suite 2014. This release offers several functional enhancements and optimized features for better performance and usability to the OpenFlow platform, which we believe will provide significant assistance to your objective of finding and developing Oil & Gas resources.